On occasion, you may encounter an animal, either in literature or the wild, that will cause you to stop and wonder how such a weird creature came to exist. The purpose of freakish adaptations can sometimes perplex even the most skilled biologists, but there often exists a ready explanation. Still, that doesn’t make these animals any less bizarre (or disturbing). Tunichates are just plain weird. Although extremely primitive and almost entirely immobile, these inorganic-looking entities are, in fact, animals. They are not conventional invertebrates, either. Belonging to a subphylum of the chordates, they are actually related to vertebrates. 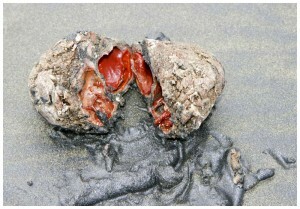 Pyura chilensis is one of the more shockingly bizarre tunichates, and seems to disprove the popular wisdom that you cannot get “blood from a stone.” The creature looks for all the world like an ancient, craggy rock, but inside is bright, red flesh. These South American “sea tomatoes” are a popular delicacy in Chile, a large part of their limited native range. Most orb weavers epitomize the stereotypical, ordinary garden spider. However, a small subsection in the genus Macracantha bend the outer limits of human comprehension. 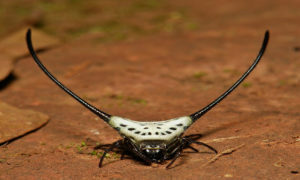 These tiny web builders measure less than a couple of centimeters (about half an inch), but instead of looking like a normal arachnid, they resemble a giant, albeit stiletto-thin, cow skull. 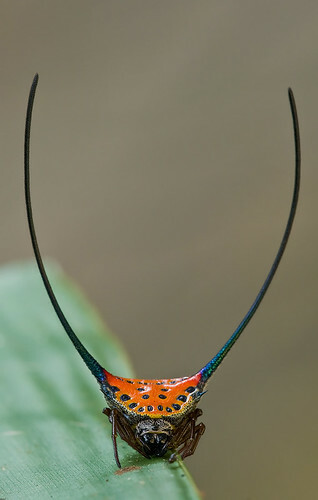 On each side of the orb weaver’s abdomen, long, decurved, and solid horns extend from a sort of rear carapace. Horns on a spider are pretty weird, but even weirder is their sheer size—each horn is up to four times the arachnid’s length. The horns are not known to serve any specific purpose, but comparison with other animals suggests that the ornaments could serve as sexual symbols, or even as “badges” to show dominance. Central America is home to what can only be described as a real-life avian version of the Davy Jones character from Pirates of the Caribbean. While many songbirds are renowned for their beauty and sweet singing, the primitive three-wattled bellbird has a shockingly loud voice and downright creepy appearance. The robin-sized bird sports dangling, fleshy wattles growing from its facial area, where the beak joins. Wattle tissue also extends around the eyeball. The three wattles are limp and soft to the touch and would seem to be something of an impediment to the bird. Its handsome plumage is apparently not sufficient to impress, as truly outrageous wattles, coupled with an extremely loud voice, are very attractive to female birds. Like many bizarre creatures, it is unfortunately an endangered species. 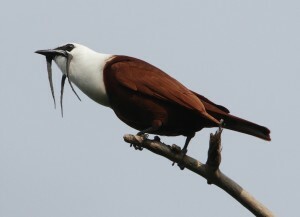 The three-wattled bellbird is migratory, but unlike most species, which go south outside of the breeding season, this weird creature travels down from the mountains to warmer lowland regions every year. The monstrous and awesome shoebill is possibly the most bizarre bird on the African continent. Standing over 1.5 meters (almost five feet) in height, and weighing over seven kilograms, the massive gray bird resembles a cross between a whale and a heron. While precision bills define most birds, the shoebill sports an enormously broad and shockingly massive bill, measuring up to 24 centimeters (10 in). It looks like an over-sized Dutch shoe, but with a truly wicked hook on the end. The shoebill will take on almost anything it can catch, including monitor lizards, catfish, and young crocodiles. The bird gained some notoriety after pictures circulated of a shoebill with a duck in its beak (it was presumably just moving it, though the shoebill does eat waterfowl). 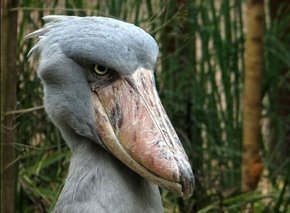 Most incredible is one unconfirmed report of a shoebill that ate a baby antelope. The clear waters off California contain lush, otherworldly forests of kelp. And in these kelp forests, wild, toothy beasts can be found lurking. 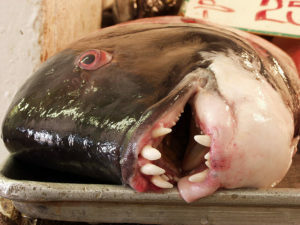 The California sheephead is a freakish fish, with huge teeth more commonly expected in a mammal. In order to effectively crush shellfish, the sheephead uses enormous, almost human or doglike teeth, within immensely powerful jaws. These shell-crushing fangs are equally suited to crushing bones, should a human hand get in the way, and can deliver serious bite wounds. The giant fish also sport showy pinkish and black scales. Oddly, all sheephead are born female. Social and environmental factors determine whether an individual fish will remain female or become a male. 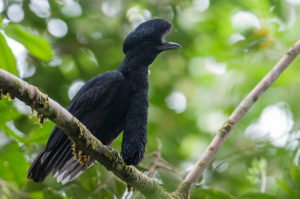 The bizarre, all-black songbird known as the long-wattled umbrellabird is a certain jaw-dropper when spotted. The creature sports a long, feather-covered appendage dangling from its chest, which assumes a perfectly rod-shaped form. The “ludicrous” bird looks as if it were mounted on a post. The giant wattle may be expanded during courtship routines and contracted while the bird hunts lizards and collects fruits, seeds, and palm nuts. Unfortunately, this endangered bird is restricted to a tiny area of Ecuador and Columbia and is increasingly threatened by hunting and land use changes. 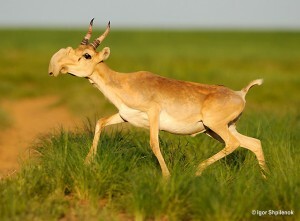 Mongolia’s rare Saiga antelope is a bizarre animal with a truly preposterous, yet purposeful, proboscis. This novel nasal apparatus means the antelope looks at first glance to be all nose, or a real-life version of Alf. The bizarre snout is thought to warm air before it is inhaled, and also filters dust from its bleak surroundings. This living relic once roamed throughout North America and much of Eurasia, instead of its limited current range in the central Asian steppes. The amazing creature is unfortunately critically endangered due to high levels of poaching. The Saiga Conservation Alliance is spearheading efforts to restore populations, and welcomes public support. 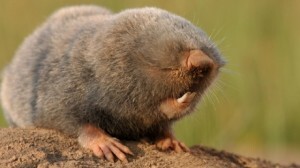 Blind mole rats are strange Eurasian mammals that burrow through the ground, largely devoid of sight. In a truly bizarre example of recent evolutionary change, their eyes remain functional, but are covered by a layer of skin, rendering the animals nearly sightless. The covered eyes still allow the mole rats to perceive light and darkness, while the layer of skin seems to protect them from the constant dirt exposure and abrasion. Interestingly, researchers discovered notable physical differences between mole rats living in the same areas. This is thought to have stemmed from lifestyle-based segregation of specific populations. Frogs, like most amphibians, need large amounts of water due to their porous, respiring skin. The water-holding frog is no exception, but still manages to survive in the dry, sandy deserts of the Australian outback. How does any amphibian manage such a feat? By carrying its water with it! During dry periods, the frog burrows deep into the ground and produces a mucus-filled cocoon, incorporating shed skin, which encases its entire body. The cocoon lets the frog retain massive quantities of water, allowing it to hibernate for up to two years until the rains come again. Aboriginal Australians have learned to gently squeeze the frog and drink some of its retained water, before releasing the animal unharmed. 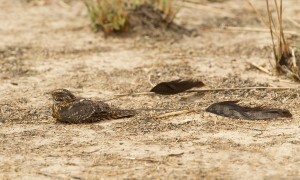 The irrationally plumaged standard-winged nightjar is anything but standard in the typical sense of the word. In fact, this bird is named for its truly bizarre giant pair of wing feathers, which can extend for over 35 centimeters (14 in). These giant, stalked feathers are actually longer than the bird’s entire body. The strange plumage accessories fly in the face of sensible aerodynamics and are therefore moulted out when they are not needed to impress females during the breeding season. The birds put on a rather spectacular group mating display and still manage to fly reasonably well despite the extra baggage. At first glance, the nightjar in flight looks like a group of three different birds. Ron Harlan investigates of the mysteries of nature and the bizarre findings that often crop up on this planet. He is a freelance writer, avid naturalist and graduate student of science. Contact Ron for custom bird and wildlife tours in British Columbia, Canada.